Anyone involved with hiring entry-level technology professionals (or reads posts on Reddit’s cscareerquestions forum) is aware that students are being prepared by schools for how to do work in the industry, but are often ill-prepared on how to find work in the industry. There is a major difference between the two, and many grads are being edged out on jobs by equally or even less-qualified peers who were just a bit more proactive about their career. If you think finding a job is only about internships and GPAs, please keep reading. Some students feel that if they aren’t working 10 hours a day building the next Twitter from their dorm room, or if they didn’t intern at Google or Amazon, that they will struggle to find work. This is hardly the case, and I assure you that if you do a few things during your college years (that require a minimal time investment and no money), you will be several steps ahead when it is time to apply for your first job. I have been President of the Philadelphia Area Java Users’ Group for 12 years, and as one might expect a typical meeting is geared around a presenter with a slide deck that gives a deep dive into some Java topic. We could hear a case study, an explanation of a tool, tips for programming effectiveness, etc. The JUG has followed this model since I founded the group in 2000, and we manage to get between 75-150 attendees at most meetings. Last month we held a meeting that was entirely different. I had reached out to Eric Raymond (aka ‘ESR’), who is best known as a leader in the open source software movement and author of The Cathedral and the Bazaar, about potentially speaking to the group. Although ESR is not commonly associated with Java, I thought it would be an opportunity for the group to hear a well-known and respected engineer speak about a topic. ESR suggested that he would do a free-form type presentation, without notes and slides, and simply take questions from the audience to use as improv material. With about 150 engineers in attendance, ESR fielded a fairly wide array of questions on everything from functional languages to open source licensing to coding standards. 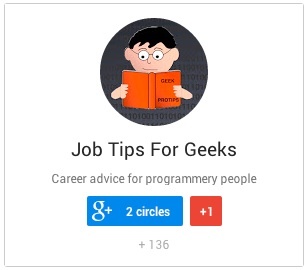 So why am I posting this article on JobTipsForGeeks? As a recruiter I am often asked for career advice by my network of engineers, and my answers are always based much more on market trends (supply and demand) and ‘buzz’ around various technologies than on the viability of the technologies themselves. For example, I am well qualified to discuss the adoption of specific languages by software companies in my region, but I am much less qualified to discuss the long-term viability of those adoption choices from a technical viewpoint. As ESR was asked some of the same questions I am often asked, I thought his answers and insights were an opportunity for the audience to hear a ‘technically-grounded’ counterpoint (or supporting evidence) to the market-based advice I provide to individuals. His specific commentary on functional programming languages and the value of learning them regardless of adoption rate was something I thought was insightful advice for engineers of all levels, and his musings on coding standards and how to obtain management ‘buy-in’ on open source are great tips for navigating at companies that may not be as tech-friendly as others. These are not all specifically ‘job tips’, but I believe there is certainly some value in reading these opinions as you decide on which directions you may take your software career. The quotes below are ESR’s responses to questions, organized by topic. “I still haven’t actually learned Java well enough to do more than a couple hundred lines of programming in it. I don’t dislike Java but I think it is a little over-verbose, it’s become kind of top heavy. So it’s not my first choice, but if I had to write something in Java I wouldn’t go ‘ICK’. Your comments are welcomed below, thanks for reading.